James HUNT 1-H0713 was born about 1770. He died 2 on 14 Nov 1815 in Heckingham, Norfolk. He was buried in Nov 1815 in the Church of Saint Gregory in Heckingham, Norfolk. James married 3 Lydia BLUNDERFIELD-B0709 on 12 Oct 1790 in Holy Trinity Church, Loddon, Norfolk. Lydia BLUNDERFIELD [Parents] 1-B0709 was born about Dec 1769 in Bergh Apton, Norfolk. She was christened 2 on 22 Dec 1769 in Church of Saint Peter and St Paul, Bergh Apton, Norfolk. She died 3 on 31 Jan 1832 in Heckingham, Norfolk. She was buried in Feb 1832 in the Church of Saint Gregory in Heckingham, Norfolk. Lydia married 4 James HUNT-H0713 on 12 Oct 1790 in Holy Trinity Church, Loddon, Norfolk. Charlotte HUNT-H0638 was born about Mar 1793 in Geldeston, Norfolk. She was christened on 07 Mar 1793 in the Church of Saint Michael in Geldeston, Norfolk. James HUNT-H0634 was born on 18 Jan 1797 in Great Yarmouth, Norfolk. He was christened 1 on 24 Jan 1797 in the Church of Saint Nicholas in Great Yarmouth, Norfolk. F iii Martha Blunderfield HUNT-H0635 was born on 30 Mar 1805. Thomas BLUNDEVILLE [Parents]-B1503 was born 1 in 1522. He died in Feb 1605/1606 in Newton Flotman, Norfolk. He was buried on 08/08 Feb 1605/1606 in Newton Flotman, Norfolk. Thomas married Rose PUTENHAM-P1501 on 27 Jun 1554 in St Stephens, Norwich. Thomas worked as Author and Mathematician in Newton Flotman, Norfolk. Thomas was the author of many books on Astronomy and Mathematics. In the London Subsidy Returns of 1576, Thomas Blundevile is listed as being worth 20 pounds and living in location/roll number 79. This book was advertised for sale by an american bookstore in October 2005. TITLE: M. Blundevile His Exercises, Contayning eight Treatises, the Titles whereof are set downe in the next Printed Page: which Treatises are very necessary to be read and learned of all yong Gentlemen that have not beene exercised in such Disciplines, and yet are desirous to have knowledge as well in Cosmographie, Astronomie, and Geographie, as also in the Art of Navigation, in which Art it is impossible to profit without the helpe of these, or such like Instructions. To the furtherance of which Art of Navigation, the sayd Master Blundevile specially wrote the said Treatises, and of meere good will doth dedicate the same to all young Gentlemen of this Realme. The sixth Edition corrected and augmented. PUBLICATION: London: William Stansby, 1622. SIZE: Square 8vo. COLLATION: Lacks A1 blank,A2-8, B-Eee8. PAGINATION: , 799, pp. DESCRIPTION: 1/2 old calf, marbled boards, front hinge creased, rear hinge partially split. Banded spine, paper labels (faded) with title just detectable in manuscript. All edges red. Front hinge reenforced along interior with cloth tape. Bookplate on front pastedown. Light to moderate browning, dampstains along lower margins often weakening strength of paper. ILLUSTRATIONS: Printer's device on t.p., numerous text illustrations throughout. 4 of 5? Foldouts-- Map of France, longitudinal globe, plate with volvule pieces, & nautical planisphere. NOTES: Thomas Blundeville (fl.1561) is largely unknown apart from his writings and a monument which he erected to his father, grandfather and great-grandfather in the church at Newton Flotman. although it is supposed that he was educated at Cambridge. He was a writer on horsemanship and young men's education, among other things. The present work went through seven editions before 1636. There is an account of Drake's voyage, an account of Mercator's globe and one by Petrus Plancius,a work on the astrolabe, treatises on navigation etc. CITATIONS: STC 3150. ESTC s115763. Sabin 6024. Cox II,363 "Of the seven or eight editions the sixth of 1622 is said to be the rarest extant..."
SUBJECT CATEGORIES: Scientific. Mathematics. Sailing. Sea. Surveying. Travel. Map. Drake. Blundeville, Thomas, fl. 1561. Arte of logick.  Plainely taught in the English tongue, according to the best approued authors. Very necessary for all students in any profession, how to defend any argument against all subtill sophisters, and cauelling schismatikes, and how to confute their false syllogismes, and captious arguments. By M. Blundevile. Blundeville, Thomas, fl. 1561. Fower chiefyst offices belongyng to horsemanshippe that is to saye. The office of the breeder, of the rider, of the keper, and of the ferrer. In the firste parte wherof is declared the order of breding of horses. In the seconde howe to breake them, and to make theym horses of seruyce, conteyninge the whole art of ridynge lately set forth, and nowe newly corrected and amended of manye faultes escaped in the fyrste printynge, as well touchyng the bittes as other wyse. Thirdely howe to dyet them, aswell when they reste as when they trauell by the way. Fourthly to what diseases they be subiecte, together with the causes of such diseases, the sygnes howe to knowe them, and finally howe to cure the same. Whyche bookes are not onely paynfully collected out of a nomber of aucthours, but also orderly dysposed and applyed to the vse of thys oure cou[n]trey. By Tho. Blundeuill of Newton Flotman in Norff. Blundeville, Thomas, fl. 1561. Theoriques of the seuen planets shewing all their diuerse motions, and all other accidents, called passions, thereunto belonging. Now more plainly set forth in our mother tongue by M. Blundeuile, than euer they haue been heretofore in any other tongue whatsoeuer, and that with such pleasant demonstratiue figures, as euery man that hath any skill in arithmeticke, may easily vnderstand the same. ... VVhereunto is added by the said Master Blundeuile, a breefe extract by him made, of Maginus his Theoriques, for the better vnderstanding of the Prutenicall tables, to calculate thereby the diuerse motions of the seuen planets. There is also hereto added, The making, description, and vse, of two most ingenious and necessarie instruments for sea-men ... First inuented by M. Doctor Gilbert ... and now here plainely set downe in our mother tongue by Master Blundeuile. Thomas died in 1605, with no male issue, leaving two daughters his co-heiresses, by whom the Manor of Newton Flotman, which had continued in the family for more than 5 centuries, was sold. Rose PUTENHAM-P1501 was born in Sherfield, Hampshire. She died in Oct 1564 in Winkburn, Nottinghamshire. She was buried on 24 Oct 1564 in Winkburn, Nottinghamshire. Rose married Thomas BLUNDEVILLE-B1503 on 27 Jun 1554 in St Stephens, Norwich. Winkburn was formerly a "camera" or cell of the Knights Hospitallers, and, like Ossington, was parcel of their Commandery of Newland in Yorkshire. An account of the "camera" of Winkburn, with a schedule of the Knights' property there, is recorded in a manuscript still at Malta-the report of Prior Philip de Thame in 1338-printed by the Camden Society, Vol. 65. Having been seized by the King at the Dissolution of the Order, it was in 1548 granted by King Edward VI. to William Burnell, a merchant of London, and Constance his wife, daughter of Edward Blundeville, of Newton Flotman in Norfolk, in exchange for the rectory of Betchworth in Surrey. Thomas Blundeville of Newton Flotman, was brother-in-law to the first William Burnell of Winkburn, and in the "postscript" to his "Arte of Logicke" (London,1617), says: "I wrote this Booke many yeeres past, whilest I sojourned with my most deare Brother in Law, Master William Burnel, a man of most singular humanitie and of great hospitalitie, at his house in Winkborne in Nottinghamshire, not farre from Southwell." Rose Puttenham, Blundevilles first wife, appears to have died at Winkburn, for her burial is recorded in the parish registers on 24 Oct. 1564. Her husband's name is there given as Thomas "Blumfeeld," a good example of the way the terminations "ville" and "field" were used indifferently in 16th and 17th century surnames. Andrew BLUNDEVILLE-B1408 died 1 after 1571 from killed in the Flemish wars. In some genealogies (eg Campling and the Visitations of Norfolk) he is recorded as Anthony. Thomas BLUNDEVILLE [Parents]-B1503 was born 1 in 1522. He died in Feb 1605/1606 in Newton Flotman, Norfolk. He was buried on 08/08 Feb 1605/1606 in Newton Flotman, Norfolk. Thomas married 2 Margaret JOHNSON-J1501 on 31 Jan 1581/1582 in St Mary's, Newton Flotman, Norfolk. Margaret JOHNSON-J1501 was born in Woodnorton?, Norfolk. She died in Oct 1617 in Newton Flotman, Norfolk. She was buried on 20 Oct 1617 in Newton Flotman, Norfolk. Margaret married 1 Thomas BLUNDEVILLE-B1503 on 31 Jan 1581/1582 in St Mary's, Newton Flotman, Norfolk. F i Patience BLUNDEVILLE-B1406 was christened on 20/20 Jan 1585/1586. She died on 07/07 Jan 1638/1639. F ii Elizabeth BLUNDEVILLE-B1407 was born about Sep 1584. She died after 1617. William DRAKE-D1701 # died in ?. F i Barbara DRAKE-D1601 # died in 1585. Sir Thomas GODSALVE [scrapbook]-G1701 was born in Norwich, Norfolk. He died in 1542. Thomas married Joan in From 1503 to 1510. Presented to Siseland Church in 1531 by right of his wife Joan and was Lord of Inglos Manor in Loddon in the same year. When he died in 1542, he was also Lord of Washingford Manor in Sizeland. The Manor of Loddon Inglos was left by Thomas to his eldest son , Sir John Godsalve. Joan. Joan married Sir Thomas GODSALVE-G1701 in From 1503 to 1510. F i Elizabeth GODSALVE-G1601 died in ?. M ii Sir John GODSALVE-G1602 was born about 1510. He died in 1557. Ralph BLOMVILL [Parents]-B1701 # was born in 1469. He died 1 on 22 Apr 1514 in Newton Flotman, Norfolk. He was buried 2 in Apr 1514 in the chancel Newton Flotman church, Norfolk. Ralph married Constance GOURNAY-G1702 # in 1498 in West Barsham, Norfolk. Devised Manor of Hempnall, Norfolk in 1490. Brass in the Chancel of Newton Flotman Church. Inherited the Manor's of Gunton and Haveringland in 1503 when his brother Richard died childless. Shortly before his death in 1514, Ralph sold to Thomas Godsalve the marriage and wardship of Edward Blundeville his son and heir, who duly married Elizabeth the daughter of Thomas Godsalve. In this extract from Blomefields 'An Essay towards a Topographical History of the County of Norfolk': volume 8, pp. 226-234. 'Eynford Hundred: Heverland' I believe that it should read Ralph not Robert. Constance GOURNAY [Parents] 1-G1702 # was born about 1478 in West Barsham?, Norfolk. She died in 1539. Constance married Ralph BLOMVILL-B1701 # in 1498 in West Barsham, Norfolk. Constance had a will on 01 Sep 1539. Her will was probated in Consistory Court, Norwich. In her Will, Constance gave her son Edward a silver gilt cup and cover, William two silver salts and other plate and to Sir John Blomvyle, priest, other legacies. M i Edward BLUNDEVILLE-B1601 # was born in 1499. He died on 11 Apr 1568. M ii John BLOMVILL-B1602 died about Apr 1567. John BLUNDEVILLE 1-B1603 died in Jun 1586 in Newton Flotman, Norfolk. He was buried on 25 Jun 1586 in Newton Flotman, Norfolk. John worked as Rector in 1567 in Rollesby. He had a will on 03 May 1586. It seems odd that there are two John's, both of whom survived to a good age. F vi Ann BLOMVILL-B1606 died after 1567. F vii Olive BLOMVILL-B1607 died in ?. F viii Amy BLOMVILL-B1608 died in ?. Sir John GODSALVE [Parents] [scrapbook]-G1602 was born about 1510 in Norwich, Norfolk. He died in 1557. John married Elizabeth WIDMERPOLE-W1601. John worked as Attorney General in London. He worked as Appointed to the Office of the Common Meter of Precious Tissues in 1532. He worked as Clerk of the Signet in From 1541 to 1547. 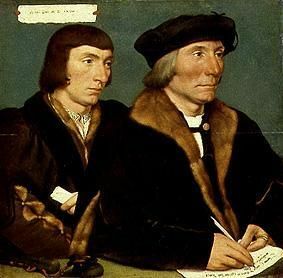 John Godsalve (c.1510-57) was first portrayed by Holbein in 1528 alongside Sir Thomas Godsalve, his well-connected father (Dresden, Gemäldegalerie). From the apparent age of the sitter, the portrait can be dated to the early years of the artist's second English sojourn. 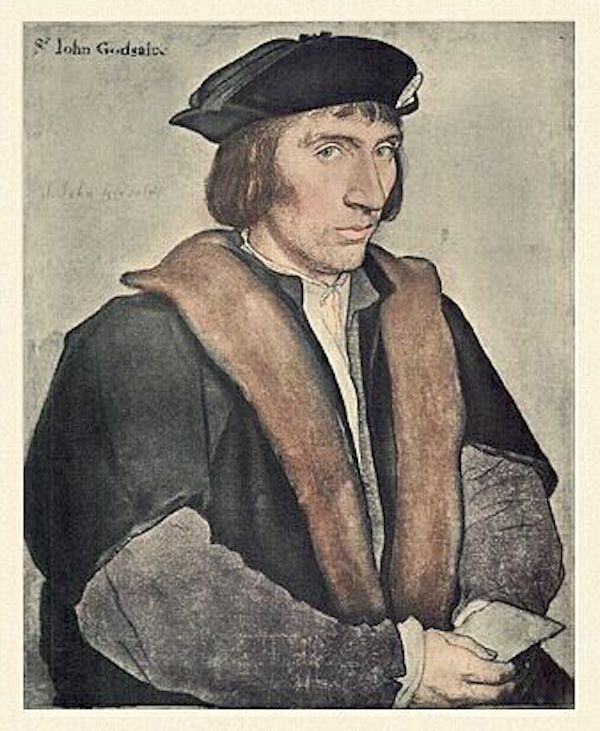 Godsalve's acquaintance with Holbein would easily have been renewed at this time, for he had been appointed to the Office of the Common Meter of Precious Tissues in 1532, bringing him into frequent contact with the Hanseatic merchants who were Holbein's main patrons following his return to England in the same year. It was perhaps this appointment that prompted Godsalve to commission a portrait of himself alone. Elizabeth WIDMERPOLE-W1601 died in ?. Elizabeth married Sir John GODSALVE-G1602. M i Thomas GODSALVE-G1501 died about 1588. Richard BLOMVILL [Parents]-B1801 # was born 1 about 1445 in Newton Flotman, Norfolk. He died 2 in 1490 in Newton Flotman, Norfolk. He was buried 3 in 1490 in Newton Flotman, Norfolk. Richard married Catherine INGLOS-I1801 #. In the chancel of Newton Flotman church, there is a brass plate recording the death of Richard and Catherine, also a shield of their arms. The burial monument in Newton Flotman church states Richard's age at death as 85, which would put his birth about 1405. This cannot be right since his father was born about 1405 and didn't marry until 1444. Estimate birth year to be about 1445. Was Lord of Newton Flotman in 1480. In his Will dated 1490, Richard devised the Manor of Haveringland to his second son Richard, who died childless in 1503, it then came to the elder son Ralph. Catherine INGLOS [Parents]-I1801 # was born in Loddon, Norfolk. She died 1 in 1495. Catherine married Richard BLOMVILL-B1801 #. M i Ralph BLOMVILL-B1701 # was born in 1469. He died on 22 Apr 1514. M ii Richard BLOMVILL-B1702 was born after 1475. He died in 1503. F iii Catherine BLOMVILL-B1703 died in ?. Henry APLIARD-A1701 died in ?. Henry married Catherine BLOMVILL-B1703. Catherine BLOMVILL [Parents]-B1703 died in ?. Catherine married Henry APLIARD-A1701. Robert INGLOS [Parents]-I1901 # was born in Loddon, Norfolk. He died about 1478. Robert married Alianora. Alianora. Alianora married Robert INGLOS-I1901 #. F i Catherine INGLOS-I1801 # died in 1495.